Elaine Scarry teaches at Harvard University where she is the Cabot Professor of Aesthetics and the General Theory of Value. She lectures both nationally and internationally on nuclear war, law, literature, and medicine, and has been a Guggenheim Fellow as well as a fellow at the Institute for Advanced Study in Berlin, the Center for Advanced Study in the Behavioral Studies in Palo Alto, the Getty Research Center in Los Angeles, and the National Humanities Center in Research Triangle Park, North Carolina. She was elected to the American Philosophical Society and the American Academy of Arts and Sciences. 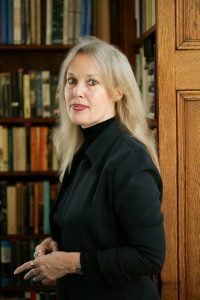 Her awards include honorary degrees from Northwestern University in the United States and Uppsala University in Sweden, as well as the Truman Capote Award for literary criticism, and most recently, the Zabel Award from the American Academy of Arts and Letters for a writer “of progressive, original, and experimental tendencies.” In 2005, Prospect Magazine and Foreign Policy named her one of the top 100 leading intellectuals. Elaine Scarry’s work has two central subjects, the nature of physical injury and the nature of human creation. The Body in Pain brings the subjects of injuring and creating together: it argues that the willful infliction of pain and injury is the opposite of creation, since it apes and inverts the ordinary work of the imagination. On Beauty and Being Just also brings the two together: it argues that beauty and justice are alike in having “injury” or “injustice” as the thing that is their opposite and that they together work to diminish. Her other writings – rather than bringing the two subjects together – emphasize either injuring or instead creating. Her recent book – Thermonuclear Monarchy: Choosing between Democracy and Doom – shows that nuclear weapons and governance (particularly democratic governance) are mutually exclusive; it specifies the constitutional tools available for dismantling the country’s nuclear architecture. Her writings on the process of poetic creation include Dreaming by the Book and Naming thy Name: Cross Talk in Shakespeare’s Sonnets. To download the event poster, please click here.